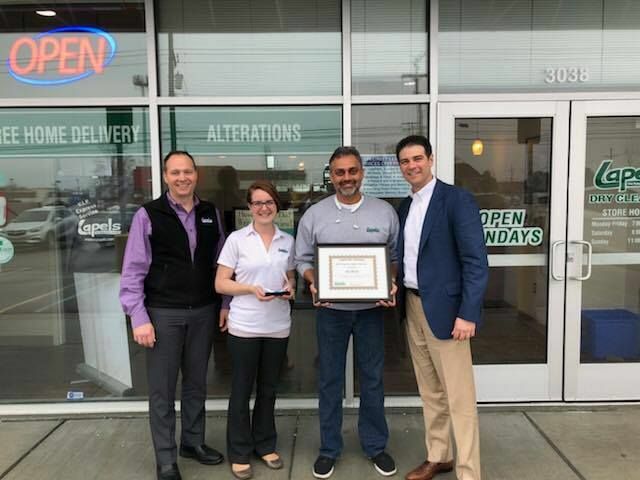 Lapels Dry Cleaning, an innovative, environmentally non-toxic dry cleaning company headquartered in Hanover, Massachusetts, recently named Jay Desai as its Franchise Owner of the Year for 2017. Desai is an owner of the Lapels Dry Cleaning of Beverly Hills at 31255-B Southfield Road, Beverly Hills, MI; Lapels Dry Cleaning of Rochester Hills at 3038 Rochester Road, Rochester, MI; and Lapels Dry Cleaning of West Bloomfield at 6552 Orchard Lake Road, West Bloomfield Township, MI. Desai immigrated to the United States in the early 2000s. While working as an IT engineer, he began his career as an entrepreneur by purchasing investment properties in the metro Detroit area. He later branched out to franchising with Great Clips. In 2014, he and his partner at Shambho, LLC signed a development deal for up to 16 locations in the metro Detroit area. The first store and dry cleaning plant, Lapels Dry Cleaning of Rochester Hills, opened in early 2015 The pair opened Lapels Dry Cleaning of West Bloomfield in October 2015 and Lapels Dry Cleaning of Beverly Hills in 2017. For winning Franchise Owner of the Year, Desai received a trophy, plaque and cash award, which was presented by Dubois during a training dinner in Troy, MI on February 15th, 2018. Next PostThe Future of Dry Cleaning comes to Nashville. Lapels Dry Cleaning to open at 6019 Nolensville Pike in Nashville and 202 5th Avenue North in Franklin TN.